Reconciliation between official and underground communities may be difficult, but it is possible. The Chinese state aims to build a national and schismatic Church. 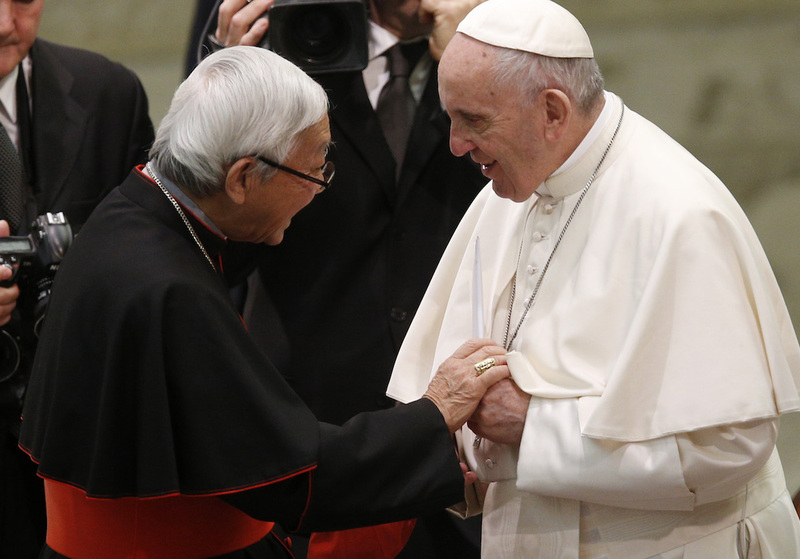 The Vatican’s veneration of Ostpolitik risks helping Beijing "enslave the Church". The manipulation of the words of Benedict XVI and obedience to Pope Francis. Hong Kong (AsiaNews) - Reconciliation between official and underground communities in China, is not "without difficulty but possible"; the need for dialogue between China and the Vatican to clarify intent, "a true religious freedom" and not a situation in which "the State ... manages the Catholic Church in China", in short a "schismatic" church; the accusations that Vatican diplomacy is "manipulating" Benedict XVI’s Letter to Chinese Catholics and their "veneration" of Card. Agostino Casaroli’s dated Ostpolitik; submission to the judgment of Pope Francis who, according to the author, is not in line with his collaborators in the Curia. These are some of the themes addressed in this essay sent to us by Card. Joseph Zen, bishop emeritus of Hong Kong. All emphasis from the original. A response to "Why we are in dialogue with China", the interview that His Eminence Cardinal Parolin gave to Gianni Valente (that is, an interview cooked up between the two). I read the interview several times, now I read it again (even if the reading repels me) in order to honestly make my comments. I am grateful to His Eminence for recognizing that "it is legitimate to have different opinions". First of all, we note the insistence with which His Eminence affirms that his point of view and the purpose of his activities are of a pastoral, spiritual, evangelical and faith-based nature, while our thinking and acting is only in a political key. What we see instead is that he venerates the Ostpolitik diplomacy of his master Casaroli and despises the genuine faith of those who firmly defend the Church founded by Jesus on the Apostles from any interference by secular power. I will never forget my amazement at reading a report in the Osservatore Romano a few years ago on a speech that he had given where he describes the heroes of the faith in the central European countries under the communist regime (Card. Wyszynsky, Card. Mindszenty and Card. Beran, without mentioning them) ) as "gladiators", "people systematically opposed to the government and eager to appear on the political stage". He also speaks of wounds that are still open and his intention to treat them by applying "the balm of mercy". But what wounds is he talking about? Towards the end of the interview, at one point he says: "To be frank, I will tell you: I am also convinced that part of the suffering experienced by the Church in China is not so much due to the will of individuals as to the objective complexity of the situation". So he knows very well that in the Church in China it is not (if not infrequently) a case of personal offenses or resentments, but persecution by an atheistic totalitarian power. Use the balm of mercy? It is not a question of personal offenses to be forgiven. It is a slavery from which to free oneself. Mercy for the persecutors? For their accomplices? Rewarding traitors? Castigating the faithful? Forcing a legitimate bishop to give way to an excommunicated one? It this not more like rubbing salt on these still open wounds? Let us return to the "objective situation". The painful state was not created by us, but by the regime. The communists want to enslave the Church. There are those who refuse this enslavement, there are those who suffer, unfortunately there are those who embrace it. Faced with this reality is it possible not to speak of "power, resistance, conflict, compromise, giving in, surrender, betrayal"? Parolin wants us to talk about communion and collaboration. But are the conditions right? Where is this unity? How can we collaborate? Thus, we must analyse the two fundamental points that need clarification. What is the unity you want to achieve? a) His Eminence praises Chinese Catholics and states that "there are not two Catholic Churches in China". If I'm not mistaken, I was the first to affirm this at a meeting of the Synod of Bishops, because, in both communities, the faithful in their hearts are loyal to the Pope (today with the increasing number of opportunists in the community run by the Government I no longer dare to apply this affirmation to the entire Church in China). But Parolin cannot deny that, for the moment, there are two communities with two structures based on two different, opposing principles. One structure is founded on the principle of the Primacy of Peter on which Jesus established his Church, the other structure is imposed by an atheistic government intent on creating a schismatic Church subject to its power. b) Eliminating this division and achieving unity must be the desire of every Catholic, but not with one wave of a magic wand, let alone by manipulating the Letter of Pope Benedict. In the Letter by Pope Emeritus there is this paragraph (8.10): "Some (bishops), not wishing to be subjected to undue control exercised over the life of the Church, and eager to maintain total fidelity to the Successor of Peter and to Catholic doctrine, have felt themselves constrained to opt for clandestine consecration. The clandestine condition is not a normal feature of the Church's life, and history shows that Pastors and faithful have recourse to it only amid suffering, in the desire to maintain the integrity of their faith and to resist interference from State agencies in matters pertaining intimately to the Church's life. "Father Jeroom Heyndrickx citing out of context the phrase "the clandestine condition is not a normal feature of the Church's life," has made it his mission to spread the word throughout China (where he enjoyed great freedom of movement):"because clandestine communities should not exist anymore, everyone must come to the open and become part of the community subject to the Government”. In the Commission for the Church in China we pointed out this grave error, but both the Secretariat of State and the Congregation for the Evangelization of Peoples ignored this warning, obviously supporting ​​Father Heyndrickx’ theory. It was only two years later, when this mistake had already done immense damage, that we managed to include some notes in the "Compendium" booklet to try to distinguish the reconciliation of hearts from unity in structures. c) Parolin says that one should not maintain "a perennial conflict between opposing principles and structures". But obviously this does not depend on us alone, because one of the two structures is under Government power, which certainly exercises control over it and shows no sign of giving it up. Pope Benedict says that the journey of unity "is not easy and cannot be accomplished overnight" (6.5, 6.6). But our diplomats want a miracle and they want it now, and not only. They also accuse others of clinging “to the spirit of opposition to condemn his brother or use the past as an excuse to stir up new resentments and closures " and of not being ready "to forgive, this means, unfortunately, that there are other interests to defend: but this is not an evangelical perspective". These are really cruel reproaches to address to faithful members of the Church, who for many years have suffered every kind of deprivation and oppression for their fidelity to the true Church! When the other party has no intention of respecting the essential nature of the Catholic Church and on our part one wants unity at all costs, there is only one possible choice, that of forcing everyone to enter the “bird’s cage". d) With the solution of the "enlarged cage" will this encourage people to walk together? To embark on a new path? With serenity? With confidence? It is said that it will be a gradual process, but let us suppose that the authors already have the next steps to be taken after the legitimization of the illegitimate in mind. Parolin and company recognize that this solution is not perfect, it is a lesser evil. You can endure and suffer an evil (damage), but you can never do wrong (sin), great or small. Our suffering at the creation of a schismatic Church by others may be inevitable, but we cannot assist in its creation. Moreover, a schismatic church created by the party is not a cause for fear, it will fade with the fall of the regime. Instead, a schismatic church with the Pope's blessing would be horrifying! With reconciliation (ad intra) and dialogue (with the Government). a) Reconciliation is not without difficulty but possible, because it depends only on our goodwill, dialogue with the Government is more difficult. 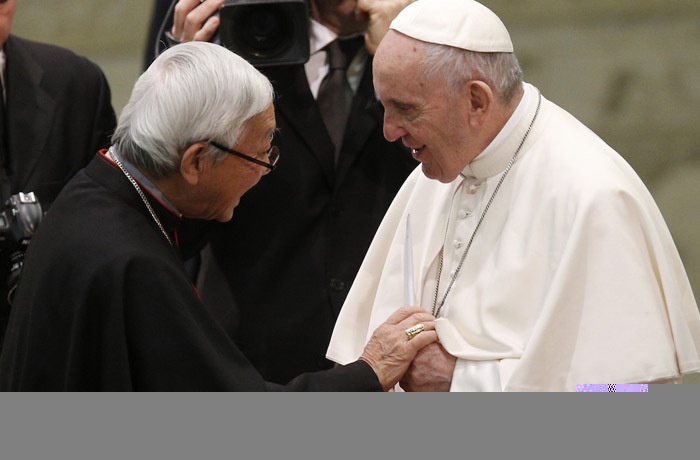 b) Pope Francis in Seoul had said: "The first condition of a dialogue is consistency with one's own identity." It is a matter of honesty, of justice. We need to know and let it be known where we want to arrive, that is, what our conscience dictates as a desirable outcome to dialogue. In our case, obviously it is: "a true religious freedom which not only does not harm but favours the true good of the nation". Will we be able to manage this dialogue? Is there a hope of success? Is there at least a minimum foundation to hope in the present situation when the Chinese Communist Party is more powerful and overbearing than ever? When, both its words and actions point to an even more rigorous control of every religion, but in a special way of the so-called "foreign" religions. The Communists no longer feel the need to save appearances. Photographs show that it is the State that manages the Catholic Church in China, which is no longer Catholic but Chinese, schismatic. (The joint meeting of the Patriotic Association and the so-called "episcopal conference is [always] led by a government official") The Popes refrain from using the word "schism" for compassion for those who find themselves not of their own will under severe pressure. In order for a dialogue to be true, it must start from a position of equality. There is no real dialogue between the jailer and the prisoners, between the victor and the vanquished. But our own seems to start from a position of weakness. Reliable source says that the Vatican Delegation could not discuss the case of Bishop James Su Zhi Min who has been in the hands of the government for more than twenty years, because our interlocutors refused. In my opinion, our delegation should have left the negotiating table and come home. Accepting their refusal is like kneeling down to them from the outset. After all we are not the vanquished. Do our diplomats not know that the faithful of the clandestine community constituted, and perhaps still constitute, the majority? That they have churches and cathedrals in various places? That in the city, where obviously they cannot have churches, they say Masses in private homes so as not to be disturbed by the public security authorities who are also aware of everything. Unfortunately, as of February 2018 we can expect a much stricter control by the Government on the activities of these our brothers and sisters, also because the Government knows that by now it also has the consent of the Holy See. c) While supporting the need for external dialogue with the government, the Vatican has stifled dialogue within the Church. With a supremely rude gesture it dismissed the Pontifical Commission for the Church in China set up by Pope Benedict without so much as a word. The only competent Chinese voice in the Vatican was Archbishop Savio, sending him as Nuncio to Greece. So much for "finding synthesis of truth"! So much for "discovering God's plan together"! They are convinced that they "have considered everything properly". The most repugnant thing I find in the whole interview is the dishonest exploitation of expressions of the Letter of Pope Benedict, making it appear as if he was a faithful supporter of the Pope Emeritus, whereas in reality he and the then Prefect of the Congregation for 'Evangelization of the Peoples have thwarted all of Pope Ratzinger's efforts to bring the Church in China back on the right path. At the beginning and end of the interview he made two citations respectively. a) In Chapter 4 Paragraph 7 Pope Benedict says: "The solution to existing problems cannot be pursued via an ongoing conflict with the legitimate civil authorities; at the same time, though, compliance with those authorities is not acceptable when they interfere unduly in matters regarding the faith and discipline of the Church.. "
b) In Paragraph 6 he had said: (Citing "Deus caritas est") "The Church cannot and must not replace the State. Yet at the same time she cannot and must not remain on the sidelines in the fight for justice.."
In both quotes, Parolin took advantage of the first half, leaving out the other half, losing the balance of Pope Benedict’s thought. Given the recent controversies, I feel the desire to clarify my relationship with Pope Francis who, whenever I meet him, fills me with tenderness. It is true that my revelations of a private interviews may have caused him embarrassment and for this I am sorry. But I am still convinced that there is a void between the way of thinking of His Holiness and the way of thinking of his collaborators, who readily take advantage of the Pope's optimism to pursue their goals. Until proven otherwise I am convinced that I have defended the good name of the Pope from the responsibility of the erroneous judgement of his collaborators and that he has communicated his encouragement to my brothers in China who are, as we say in China, "in the burning fire and in deep water". If, by chance, one day a bad agreement is signed with China, obviously with the approval of the Pope, I will withdraw in silence to "monastic life". Certainly as a son, even if unworthy, of Don Bosco I will not make myself the head of a rebellion against the Roman Pontiff, Vicar of Christ on earth. Let us pray for Pope Francis "that the Lord will preserve him, give him strength, make him happy, and save him from the hands of his enemies." Dear Chinese bishops, where is the measure of your heart?